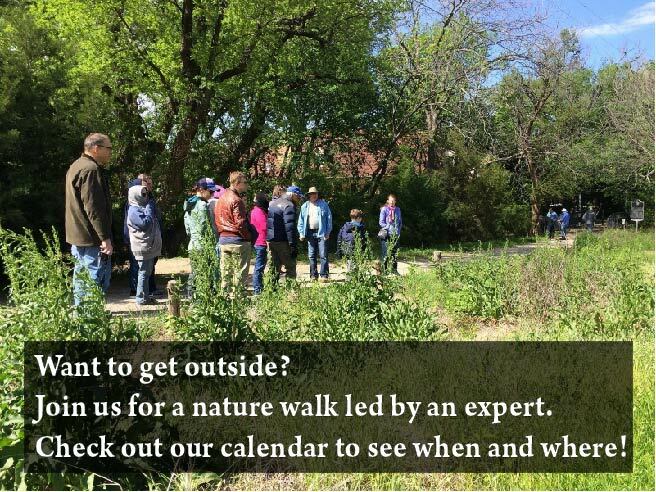 We appreciate your interest in the Texas Master Naturalist Program. 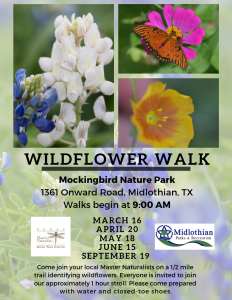 Our mission is to develop a corps of well-informed volunteers who provide education, outreach, and service dedicated to the beneficial management of natural resources and natural areas within their communities for the State of Texas. The North Texas Chapter primarily serves Dallas, Rockwall, and Kaufman counties. The Texas Master Naturalist website provides a map and links for chapters across the state. Submit the application for the class and pass the mandatory background check to be accepted into the program. To become a Master Naturalist, you must be at least 18 years of age. Complete the training program: 40 classroom hours, 3 field trips (1 each for Aquatic, Prairie, and Forest ecosystems), homework, and class project. Obtain a minimum of 8 hours of approved advanced training. Complete a minimum of 40 hours of chapter approved volunteer service. Master Naturalists maintain certification each year by completing 8 hours of advanced training and 40 hours of volunteer service. The next class will start on Tuesday, February 5, 2019. Applications are now closed for the Spring 2019 Class. Applications for the next class in Spring 2020 will open at the end of the year (2019). Preference will be given to applicants who express a commitment to stewardship of our natural resources; a willingness and availability to contribute time to volunteer service; a desire to complete the coursework, homework, and field trips; and those already volunteering. Particular consideration will be given to those who express willingness to serve in leadership roles for the Master Naturalist program. Applicants have been notified of acceptance status. The registration fee is $200.00, which includes first year’s membership payment, textbook, and other supplies. Please pay only AFTER you receive an acceptance notice. Detailed instructions will be given at that time. Acceptance notices will be e-mailed no later than December 20. Some partial scholarships are available. Send an e-mail to newclass@ntmn.org to request a scholarship application. Scholarship applications are due on January 1, 2019. Enter the amount of $200 in the Price per item box. What does the training program cover? The class provides volunteers with a broad naturalist education: ecological concepts, ecosystems and natural history; human impact on nature; and awareness of ethics, value judgment, and citizen science. Instructors are local experts in the natural resources community from universities, state and federal agencies, and nature centers. 2019 Class, please see the 2019 Class Page for up-to-date details. Tuesday evening classes meet from 6:00 to 9:00 p.m. Most classes meet at Brookhaven College, 3939 Valley View Ln, Farmers Branch, TX 75244. The March 12 class meets at Texas Discovery Gardens. To obtain certification, each trainee must attend at least twelve of the thirteen classes. To obtain certification, each Trainee must attend one field trip in each category. Field trips take place on weekends. Several options will be available for each category. Who can I contact for more information about the training program? If you live in Collin, Denton, Ellis, or Tarrant County, consider your local chapter. The Texas Master Naturalist website provides a map and links for chapters across the state.